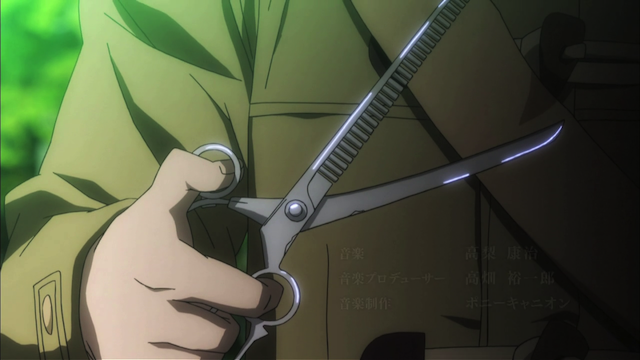 A cursed pair of scissors. Having nothing better to do, I thought I would check out episode 1 of Dansai Bunri no Crime Edge. Boggled, I had to watch it again, just to make sure I actually saw what I thought I saw. Kiri Haimura, a boy obsessed with cutting. Iwai Mushanokouji, a girl obsessed with being cut. I have no idea where this show is going from here, but the first episode was well worth watching for the WTF factor. The male lead takes no responsibilities for his own actions; in the opening moments he claims to have “accidentally” gotten off at the wrong bus stop, and then approaches the house of a girl with long hair, scissors in hand, physically acting out his fantasy of cutting her hair off. Later we learn that the scissors he carries with him were used by an ancestor of his to murder young women. The whole issue of “killing goods” that were passed down in a family seems to be important to the plot, because we have already met others who have inherited “killing goods” from ancestral psychotic killers. Warning: this show goes above and beyond the typical lolicon show by some sort of murder fantasy. Not only does the male lead stalk the loli, tell her he wants to kill her, and cut off her hair, she actually tells him that she wants to be killed (although they are talking metaphorically about hair?) I think I would normally find it all very disturbing, but somehow the earnestness of the presentation pushes the whole thing into terribad territory. I don’t think I can, in good faith recommend this series, but the first episode was hilarious. I guess the show is moving towards a battle genre in which Kiri and Iwai have to fight against a secret organization of people who have inherited “killing goods”. Or it could be a romantic comedy? Either way it still looks like it probably will be terrible, but perhaps impossible to stop watching. I suspect this may turn into one of those shows one would be embarrassed to admit having watched. I certainly was very intrigued by this first episode. Yeah, I can’t see how it ends up being a good show, but the ultra-serious treatment of ridiculous subject matter was pretty funny to watch nonetheless. Haven’t see it yet, looking to watch this series, the setting was bizarre and it seems that the first episode lives up to the bizarreness . Always gotta have something completely wacky to watch in a season.